Burgundy chocolate hearts are a quality chocolate made by a Brisbane company. Chocolate Gems, a family business since 1994, use their own blend of chocolate courvature. They also have one of the highest Food Safety System Certification – FSSC 2200:2010. Use chocolate hearts for your wedding bonbonniere. Tradition uses an odd number of chocolate hearts. This is because it cannot be divisible by 2. This also symbolizes the couple in a marriage and that they can not divide. Using 5 chocolate hearts will symbolize health, joy, fertility, prosperity and also longevity. There are 60 in 500g, 120 in 1kg and 600 in 5kg. 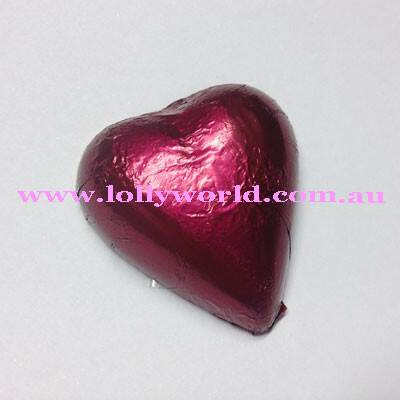 Each chocolate heart has a burgundy foil wrap. This makes them easy to scatter on a table, or pack into bonbonniere gift boxes. Add elegance to your special day and use chocolate hearts for your wedding bonbonniere. This product will keep its shape well in warmer weather, as long as you don’t play with it. Colour may vary depending on monitor settings. Large quantities may require a couple days to order in. Order online and have burgundy chocolate hearts delivered to your door.